Pattern Row - ch1, 1sc in base of ch1, * skip 1sc, 2sc in next sc, * rpt from * to * to end. Turn. Rpt Pattern Row twice more. Fasten off. # # Join in contrast color and work Pattern Row twice. Fasten off. Rpt from # # to # # once. Join in contrast color and work Pattern Row twice. Fasten off. from now on work Pattern Row once. Fasten off. Rpt from # # to # # three more times, do not turn at the end of the row. each row end to corner, 3sc in corner, 1sc in each ch along cast on edge to corner, 3sc in corner, 1sc in each row end to next corner, 2sc in corner, sl st to first sc. Turn. Fasten off. in last sc, sl st to top of ch3. Fasten off. ie. Kapok or cotton wool etc, so that the top pushes up slightly, over sew open gap to close with length of yarn left earlier. Sew in and tie off any other loose ends of yarn. 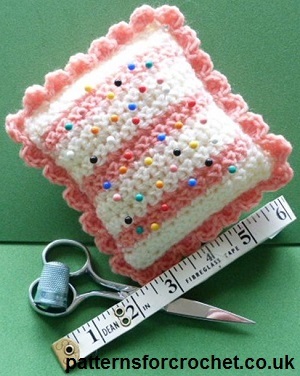 Hope you enjoy this free crochet pattern for pin cushion.